Viswanathan Anand said he might play at the Candidates Tournament, which will take place in Khanty Mansiysk, Russia, from March 12 to 30 next year, in his bid to challenge Carlsen again. 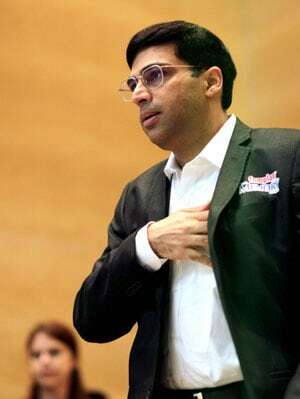 He might have been dethroned as the world champion by Norwegian prodigy Magnus Carlsen at home, but the hunger to succeed is still alive in Viswanathan Anand who says he is looking forward to fix some issues and start the new season on a positive note. "The hunger is still there. Only time will tell whether I do that successfully or not. I will keep on trying. I am an optimistic person. Certainly, I did not lack efforts this time. Sometimes, you have to get the formula right," Anand said here today. "It will be very good to say goodbye to 2013. Also, there are some issues to be solved. I hope 2014 starts on a positive note. You always start a year in a good frame of mind," the five-time world champion added. Anand said he might play at the Candidates Tournament, which will take place in Khanty Mansiysk, Russia, from March 12 to 30 next year, in his bid to challenge Carlsen again. "I will play in Zurich in the end of January. I have not yet taken a final decision on the Candidates. I would imagine I would play. I'm quite motivated to try again next year. "First, I will take some rest. Most likely I would play. Broadly speaking, as long as you find challenging events, and you enjoy doing it, you play. I am also looking forward to play rapid chess next year," he said. Anand conceded that the loss to Carlsen was hard to swallow for him as he would look to address some problems creeping into his play before starting the coming season afresh. "Right now, I am focusing on getting my career back on track. This year was tough for me. I hope 2014 goes better. I will take one step at a time. There were many problems affecting me on the chess board and in general from a year or so. I felt I would have to address that before the match. But it's clearly I've run into some problem areas in chess and I just need to address that," he said. Talking about the 23-year-old Carlsen, Anand said he was "difficult" to read. "He was very difficult. He is the highest rated player in history. He won comprehensively in the (World Championship) match. It would have been nice to go down in a better way. It was a disappointment at many level." Anand said Game Five was the turning point of the 12-match title duel. "Game five affected me even more than it should have. My level also dropped off in the remaining games. Of course, I know it should not, but it did. Circumstances just took over. I don't think it was a big factor." Asked whether age was catching up with him, the 44-year-old said: "Yes. Age has been a factor to put it mildly. There is not much you can do about it. I want to focus on results. With age, you tend to change your approach and try to compensate with your experience. That's a fact of course." "I can think of seeing myself at 50 but not beyond. It's clear that the average age in chess is dropping fast. In fact, most of the top 10 are young players. I can't set myself a number of years. I will keep playing till I enjoy playing." Anand started off brilliantly in London Classic but only to lose in the quarters to Vladimir Kramnik. "I was trying a different approach. I was trying to experiment a bit and play freely. It worked in group league. It was going well in knock out stage but the position fell apart quite fast." After Anand, India clearly have a big gap to fill to compete at the highest level but he remained hopeful that somebody would emerge soon. "I'm optimistic that somebody will turn up. I feel we have many right things in place. We have a lot of participation also at the school level. Chess is definitely growing in India. I think it's just a matter of time." Legendary Garry Kasparov has announced his candidacy for FIDE President post but Anand said administration was not his cup of tea. "The question is whether you're good at it or not. It does not seem natural that players become administrators. It's about whether you can do the job or not. I would assume that players are not necessarily better administrators." Talking about the retirement of Sachin Tendulkar from the international cricket, Anand said, "Our team has enough depth. We have some very good cricketers in the pipeline. Perhaps Sachin's absence is more of emotional." Anand was in the city to mentor chess enthusiasts of Kolkata as part of NIIT's promotional event.